This entry was posted in Ukraine, Ukrainian on September 27, 2012 by FEMEN. 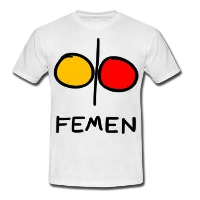 This entry was posted in Ukraine on August 17, 2012 by FEMEN. This entry was posted in Russian, Ukraine, Ukrainian on April 17, 2012 by Larysa. FEMEN staged a protest in the belfry of St. Sophia Cathedral in Kyiv. This entry was posted in English, Ukraine, Ukrainian on April 12, 2012 by FEMEN.